Feeling kind of blah? Does the winter weather have you feeling a little down and out. Not so confident; with storm clouds running through your head? Have a listen. Relax. Jump around your living room and twirl like a banshee. Sit on your computer and do a little chair dance a la spiritedwildfire. I promise you’ll feel better. 🙂 Download this track and put it on your mp3 player. Put on some stilettos, and hit the sidewalks. 😉 My friend Raghkstar has sent me just the thing to kick the hump day blues to the curb, and he’s allowing you lovely readers to download it here free. Just spread the love and word, and lets get the world smiling and strutting to the beat. 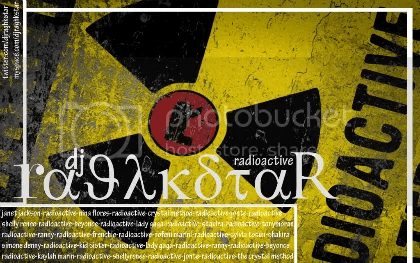 DOWNLOAD RADIOACTIVE MIX FOR FREE – Courtesy of the one and only DJ Raghkstar. Categories: Uncategorized | Tags: anxiety, beauty, club music, dance music, depression, dj raghkstar, energize, fashion mix, happiness, hump day blues, Inspiration, joy, love, mid week slump, peace, raghkstar, relax, remix, seasonal affective disorder, spiritedwildfire, winter blahs, worry | Permalink.